A pretty dark movie that only gets going in the second half, when it turns to some plot surprises and back-story. 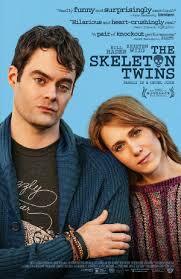 The Skeleton Twins is a movie about depressed siblings who haven’t seen each other in ten years. It opens with a suicide attempt where Milo (Bill Hader) settles into a bath tub, lies back, and relaxes. Then suddenly blood fills the tub, entering the screen from out of frame, revealing that Mili has cut himself. He is brought to a hospital where his estranged twin sister, Maggie, (Kristin Wiig), gets a phone call about his condition. The irony is that at the exact moment she gets the call about her brother trying to kill himself, Maggie was in the process of doing the exact same thing, herself. Her brother beat her to the punch. This is the kind of bleak dark humor that characterizes the movie. Milo now comes to live with Maggie and her husband, Lance (Luke Wilson), in the town where the siblings grew up. It’s been ages since he and Maggie spoke, let alone lived under the same roof, with Milo living out in California pursuing a career in acting. He’s always considered himself an outcast, knowing he was gay ever since he was a teenager, and being at the center of a scandal back when he was in high school. The opening scenes remind me of a sort of combination of the starts to Little Miss Sunshine and You Can Count On Me. Those are two movies to be in good company with, and I like how this film uses ideas from both (the suicide attempt, the sibling coming to stay with the other,) while at the same time being its own thing. The best feature of this movie is all of the secrets it has hidden up its sleeve, which really start to come out in the second half. It’s the first half of the movie that is sometimes a little slow and tough to get through. Once at Maggie’s place, Milo meets Lance and can’t believe the kind of guy that his sister married. Lance is a friendly all-American kind of guy. He’s always happy and positive and seems both wholesome and athletic. This guy appears to have no downside at all. What in the world is he doing with the depressed and morbid Maggie? Milo, for one, certainly can’t figure it out. He likes Lance, but recognizes, right away, that this guy just doesn’t fit in with them. Milo goes to work with Lance, clearing shrubbery and trash from construction paths. The two of them bond through funny moments like when Milo wears short sleeves to his first day on the job and can’t grab much debris because of it, (this scene would have been better if it ended with a shot of Milo’s arm all scratched up.) The two of them also have a dudes day where they go rock climbing together. Milo becomes fond of Lance, which makes it that much harder to deal with when he learns of how his sister is keeping things from him. That all comes out much later in the movie. First, we get a scene where Maggie shows up at home to find an unexpected visitor. Milo has invited their mother over. The mother lives in another state, has a new family with three new kids, and hasn’t spoken to either Milo or Maggie in years. In fact, she even missed Maggie’s wedding (so did Milo, apparently, although for some reason that fact is never brought up.) Maggie is not happy to see her mother and after a little bit of conversation, the real reason her mother being in town comes out. It’s a nice ending to the storyline about the mother, and a little surprise to end it with a bang. This is nothing compared to what’s coming up. One thing that comes out of the mother visit is that we get the reminder that their father committed suicide, and that there’s a good chance he did it because of how miserable he was with his wife. It isn’t long after this that another character comes into the picture. This is Rich (Ty Burell, from TVs Modern Family.) He is working at a book store and not especially happy to see Milo. We soon learn the reasons why. The movie treats the Rich storyline well, unveiling clues little by little, to help us piece the puzzle of what happened together. Meanwhile, Maggie has some problems of her own. That wholesome and perfect relationship she has with her husband isn’t quite as perfect as it appears. Not that there’s anything wrong with Lance. With him, what you see is really what you get. But Maggie is cheating on him with her scuba instructor and apparently there have been other men, since she has been married, too. Maggie also has a problem with the idea of having kids. Lance is thrilled about them trying and super excited that they are both on board and ready. Only Maggie isn’t. And instead of telling her husband, she secretly hides birth control pills around the house. Maggie confides all of this (both the birth control and the affairs) to her brother, Milo. I love the way this movie gives both of the siblings secrets and story lines that unfold as the movie goes on. This is the kind of film that really rewards patience. In both cases, the other siblings gets involved with their brother / sister’s problem. In the case of Milo and his story from the past, we learn of where Maggie fit in, and it’s one more secret this movie is holding onto. But that’s not all. Milo is holding something back from Maggie too, and of course it all comes out at the worst possible time. This movie is pretty rich in back story and twists, but it takes just s little bit too long to really get going.